In a critical decision to protect students and taxpayers from fraud and abuse in higher education, the U.S. Department of Education this morning rejected the request of the CollegeAmerica / Stevens-Henager college chain to have its status changed from for-profit to non-profit for purposes of federal financial aid rules. 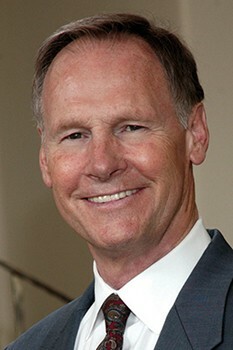 The Department concluded that the chain’s conversion to non-profit status appeared primarily to benefit the for-profit chain’s owner, Carl Barney, rather than students. The Department’s release is below, and its determination letter is here. The U.S. Department of Education today denied a request from the Center for Excellence in Higher Education (CEHE), a Utah-based chain of for-profit career colleges, to convert to non-profit status for purposes of federal financial student aid. The denial means that the colleges’ programs must continue to meet requirements under thefederal Gainful Employment regulations. “This should send a clear message to anyone who thinks converting to non-profit status is a way to avoid oversight while hanging onto the financial benefits: Don’t waste your time,” said U.S. Education Secretary John B. King Jr. This denial does not directly affect the approximately 12,000 students who attend the four institutions owned by CEHE – Stevens-Henager in Utah and Idaho, CollegeAmerica Denver, CollegeAmerica Arizona, California College San Diego and CollegeAmerica Services – but it does mean that the Department will continue to limit the colleges to getting no more than 90 percent their revenue from Title IV federal student aid. It also means that the institutions must meet all federal regulations for for-profit colleges. CEHE first applied for non-profit status with the Department in the fall of 2012. In reviewing that request, the Department determined that CEHE, which had been a small educational non-profit that did not provide educational services, acquired four for-profit college companies owned by the Carl Barney Living Trust. CEHE promised to pay the Trust more than $400 million dollars, and the colleges were merged into CEHE. When that happened, Mr. Barney became the board chairman of CEHE, and because of the way the transaction was structured, retained significant control of the colleges, despite the change in ownership to CEHE. While CEHE is recognized by the Internal Revenue Service as a non-profit company, the colleges’ tuition revenue continues to flow to Mr. Barney through the Trust to pay off the debt that CEHE owes from acquiring the colleges, and through the rent that some of Mr. Barney’s other companies receive as landlords for several of the college campuses. Under 34 C.F.R. § 600.2 of the Higher Education Act regulations, non-profit institutions must be owned and operated by a non-profit where no part of the net earnings benefit any private shareholder or individual. Since 2012, the four institutions have continued participating in the Title IV financial aid programs on month-to-month agreements as for-profit institutions. 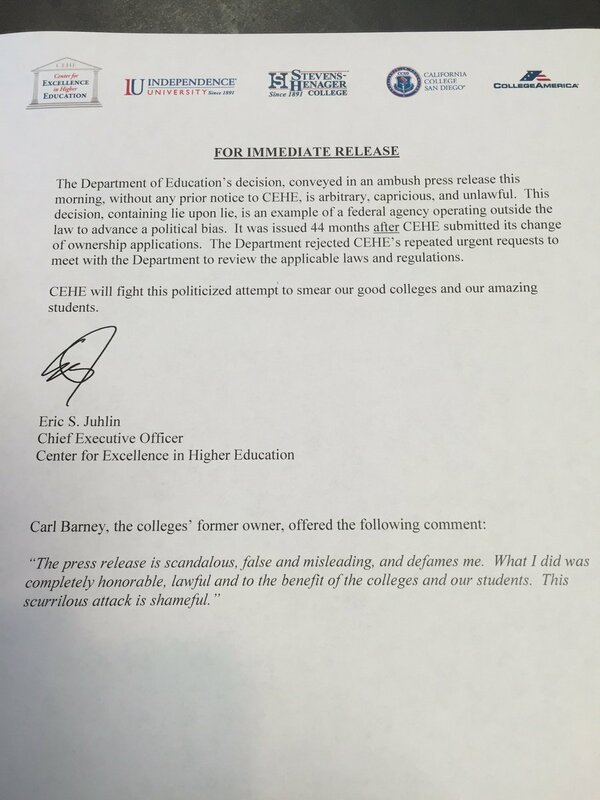 In a letter to the company’s CEO, Eric Juhlin, the Department approved the change in ownership that CEHE requested but continues to recognize Mr. Barney as maintaining significant control of the institutions and the Title IV revenue they produce. During the review of the change in ownership request, the Department requested additional documentation from CEHE. The company provided information to the Department but marked much of it as confidential, and that information has been removed from copies of the letter made available for public review. Documents subject to CEHE’s confidentiality designation would have to be requested for public review under the Freedom of Information Act. During the time the applications were under review, risk factors identified in CEHE’s financial statements – including a lawsuit against one of the institutions filed by the Colorado Attorney General – led the Department to require CEHE to provide a $42.9 million surety, which is 30 percent of the annual federal student aid funding for 2013 for the four institutions. That surety remains in place but is subject to adjustment based on CEHE’s financial condition and other risks. To qualify for federal student aid, the law requires that most for-profit programs and certificate programs at private non-profit and public institutions prepare students for gainful employment in a recognized occupation. More on this developing story here and here. This article also appears on Huffington Post.